For some months now I've been feeling sad that I didn't discover LotRO sooner. Like I've missed out on years of the fun and experiences that this game has to offer, and that I didn't get to discover them with everyone else. It's only in part down to the forum posters bemoaning the game they lost as LotRO went on growing and changing. I have been playing since September 2012. I sneak on in my spare half hours, while my dinner is cooking, if I get home from an evening out before 10. Now more than ever I feel like this game is home, the community is something really special, and I wish I had spent more time in this Middle-earth of ours. And only now have I really got involved with a group of people who feel the same way about the game as I do. This past weekend we celebrated a landmark for the Lonely Mountain Band kinship. On March the 25th, on Tolkien Reading Day, Gondorian New Year, the LMB hit 7 years of age. On Sunday 29th, we had a meeting of special magnificence that stretched from dusky dinner time until gone midnight. It began with the forging.....with the meeting at the kinhouse. Speeches were given and much cheering garnered in response. Despite the problems the musical community is having at the moment, I believe it's going to be an exciting year for the Band, with a few events coming up (Spring Racing Carnival, Weatherstock, TSO performances), and some fun activities already underway. 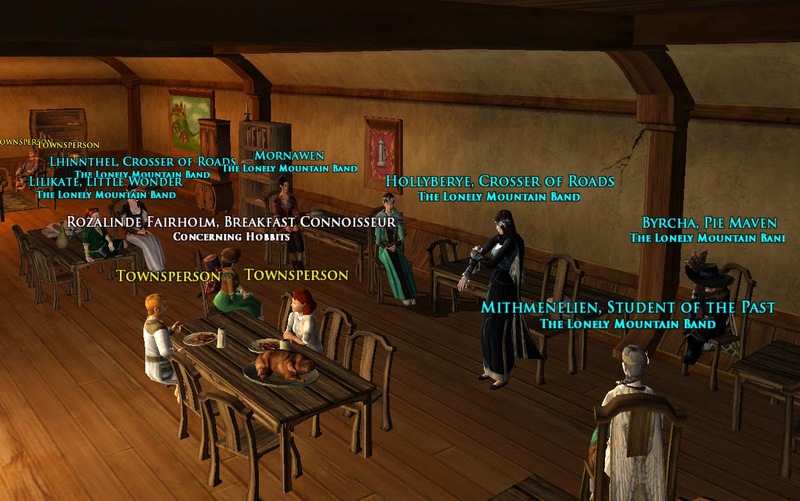 Speaking of which, on Saturday night the inaugural meeting of the new bookclub was held at the Bird & Baby Inn in Michel Delving, and Elimraen got to attend. We're reading and discussing The Children of Hurin. As a ponderous introvert this had the potential to be quite the intimidating evening, but it turned out to be a great discussion of what looks like an amazing book. Already I want to do all the research I can into Fingolfin, and draw up all my own family trees for the ancient Elves! There were 9 of us who attended, a nice mix of new readers and those who know much more of the lore than I do. Elim is really excited for the next meeting. Back to the anniversary! Next, we all mounted up for a group shot (I'm hoping that someone got a better one than I did, I was too close to the end to get a shot with everyone in), then paraded, mostly at a walk, all the way to Bree-town. It coincided with a sunny afternoon ingame, so we got to walk in sunshine, glimpsing rainbows and local wildlife as we meandered our way through Ered Luin, the Shire, and finally Breeland. We made our way on horseback to the Bree Park where the Andune Ensemble, with guest star Calanne, were to play their special concert featuring the entire Fleetwood Mac Rumors album! And then we were onto the final planned part of the evening, the Mad as Heck raid. 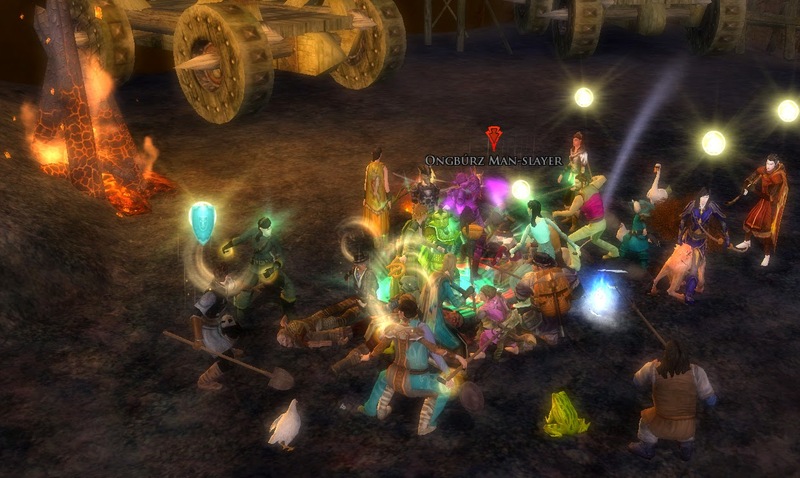 I think a total of twenty seven of us gathered in Esteldin, armed with nothing but our valour and our tempers. Well, almost nothing. Weapons that I saw in the crowd included pitchforks, shovels, a rolling pin(? ), a fish, frying pans, a regular sized flower, flowers the size of people, a pretzel, sparklers, and a basket of apples. Our first task was to dwell upon things that make us really really super cross. Elim failed at this because of a giggling fit that she barely managed to conceal. And then we were off, racing through the hidden town of the Rangers, to the east and north, to storm Dol Dinen and take down the trolls and fell creatures that dwell there. Then, because people still hadn't whacked the trolls hard enough to rid themselves of their rage at stuff like rain, sun, no organised pictures, and no circus in the promising-looking tent, we ported to Tinnudir for an assault on Annuminas. It was there, in the ruined city, after battling our way through enemy stronghold after enemy stronghold, that our terrible anger was sated. And I went to bed because it was half past midnight.